It’s a mindset. A commitment to projects that support vibrant, thriving communities and long-term sustainable returns. It’s a devotion to the brightest talent. It’s an appetite for boldness, creativity and continuous innovation. It includes sustainability strategies that reduce risk and deliver a multitude of tangible economic returns. It is mission-driven, impact focused and profit minded. Mission & purpose are a competitive advantage. The more we focus on purpose, the more money we make. Meraki aims to accelerate adoption and firmly embed “triple bottom line” principles as a core part of any real estate investment strategy and decision making process. What distinguishes us is a proactive intent to deploy capital that generates risk adjusted market rate returns while creating social and/or environmental value. We focus on a people-centered approach to real estate investment. Layering in resource use, cutting edge technology and building practices, and protection of the natural environment, we believe these serve to create robust economic returns. Wealth generation for all stakeholders creates a more durable investment. By increasing our knowledge base and strengthening our execution we are better able to serve our clients, partners, tenants, investors and communities. We understand the importance of “People, Planet, Profit” as a real estate investment strategy. Strategies that support environmental and social values effectively manage risk, improve competitiveness, enhance operational efficiency and maximize returns. Do Well – Do Good. Forge Long-term Relationships. Innovate. Think Creatively. Build Community. Lead. 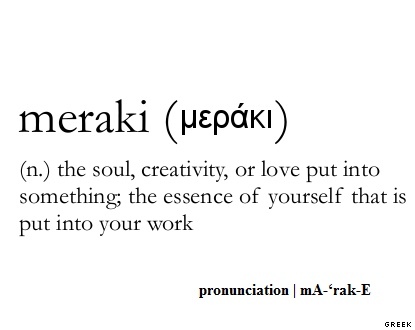 Meraki represents this powerful ideology. It has little to do with where companies operate and everything to do with how and why. With the reach and the velocity of information and resources increasing, the developers we invest with are great businesses with successful track records and a belief that doing well and doing good go hand in hand. In our experience, a using a holistic lens provides an insightful management tool and drives superior value. Our objective is to create competitive and durable market-rate returns. All of Meraki's efforts emphasize intensive foundational research and a focus on growth and investor "value add", rather than reliance on excessive risk, as the best path to high and consistent long term returns. At its core, real estate is about people. At their best, buildings provide places for people to live and work in comfort, engaging their senses and creating communities that withstand the test of time. And business is the largest aggregator of human potential. Our goal is to invest in and create assets that by their nature accelerate and enhance this potential. Our success is predicated on the long-term health and vibrancy of the cities where we invest. It is hard to imagine operating a real estate firm without taking into consideration the underlying integrity of the community. We start with sound real estate fundamentals and then tactically and strategically augment asset cash flows by selecting, integrating, and optimizing high performance technologies and incentives at the asset level and economies of scale at the portfolio level. By combining design and technology we reduce operating expenses. By incorporating education and sustainability protocols we improve risk management and enhance cash flows.